It seems that our once-raging war against terrorism has now, at least publicly, been downgraded to some unpleasant cyberbullying. 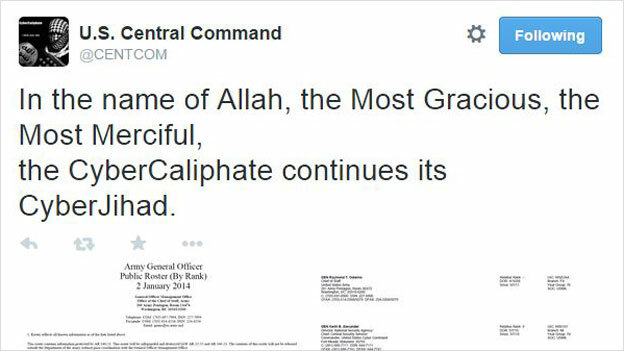 As reported by the BBC, the United States Central Command's Twitter account was hacked by the revolutionary Islamic fundamentalist group IS, who referred to their online troll brigade as "the CyberCaliphate" in the attack. Their "CyberJihad" didn't seem to accomplish much more than ruffling a few feathers, despite the "leak" of "secrets" like a few upper-echelon bureaucrats' mailing addresses. Nerdy terrorists. Great, just what we need. The Centcom Twitter account, which was known to report on strikes against IS (before the account was taken down after the hack-attack), provoked a standard "appropriate measures" response as to what was being done in retaliation. The hack occurred while President Obama was giving a speech on cybersecurity. Several maps and diagrams were "released" by the hackers, but these appeared to be vague logistics of maritime armaments along the Chinese coast, as well as maps of various installations in North Korea. Nothing was more of a "secret" than a little googling couldn't uncover, with much of the (completely non-threatening) information sourced from U.S.-based think tanks. The full feed. This could easily be an Islamic twelve-year old. According to Reuters, The Defense Department wasn't flustered, stating the government "views this as little more than a prank, or as vandalism...It's inconvenient, it's an annoyance but in no way is any sensitive or classified information compromised," Pentagon spokesman Army Colonel Steve Warren said.Nevertheless, when posted in conjunction with incendiary (fake) headlines reading "PENTAGON NETWORKS HACKED! ", the IS troll brigade probably raised a few heartbeats in Washington. For a minute. Then we continued bombing them in real time, without needing to tweet about the success. The "CyberJihad's" silence in America will speak to that. Unfortunately in France, the AnonGhost cyberterrorism group, a pro-Islamic organization, have tried to terrorize French websites in wake of the Charlie Hebdo attacks. The UK Mirror reports that larger and more notorious computerized collective Anonymous have vowed revenge for the Charlie Hebdo attacks and have been plaguing IS sites throughout the last week. This e-poking might escalate to even further name-calling and photoshopped images of completely unbelievable terrorist victory. In the meantime, they can continue to spam the internet with narcissistic content worthy of a facebook-addicted tween.